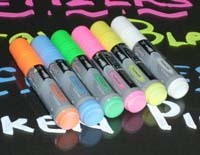 Wet Erase Markers - Liquid Chalk for Bright Messages! Where else can you find a wet erase marker at such affordable pricing? Nowhere on the web! Plus, if you purchase a wet erase marker set prior to 3PM EST it ships the same day! Great prices and quick shipping: that’s what this website is all about. 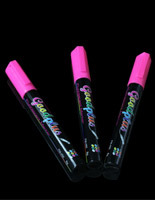 This wet erase marker is commonly used by bar and restaurant workers to create bright and exciting signage. 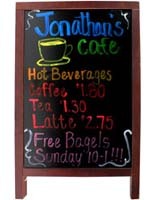 Use these fluorescent liquid chalk pens to make a daily menu special sign, or a list of summer drink specials. The uses for this wet erase marker are practically limitless. This selection of fluorescent pens is very diverse and includes both neon colors and the newly added earth tone shades as well. Buy a wet erase marker set of both types and begin creating a sign that will garner the attention of all the passersby. These bright sticks can be used on signs for indoor or outdoor use. As with any marker board; they should not be left outside in extreme weather conditions. Most pubs and taverns usually have some type of backlit sign used to announce daily drink specials or upcoming live entertainment. This wet erase marker is perfect for use on neon marker board. The edge lighting enhances the color of these liquid chalk pens and makes a bold statement to the viewers. 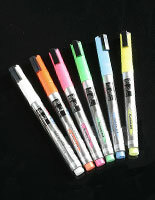 These wet erase markers often come in neon colors which is ideal for the dim lighting typically used in bars and cafes. Even with the marker board is turned off the text or illustration is still vibrant enough for passersby to stop and take a look. Many of these wet erase markers come in a set of 6 or 8 fluorescent shades; a diverse assortment to create an amazing sign or menu fixture. 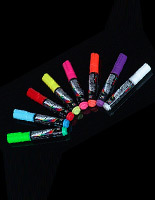 There is also a variety of tip styles to select from among the current in stock liquid chalk pens. 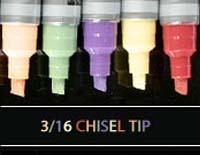 Use wet erase markers with a fat tip to fill in large areas, or a chisel tip fluorescent pen to make text or prices. There are also fluorescent wet-wipe pens with a bullet tip that can be used for finer detail work. 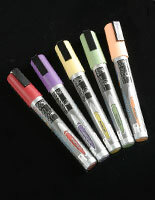 The wet erase markers offered here are water based and non-toxic. 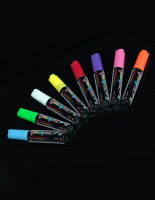 These neon wet wipe pens are also suitable for use on “fair weather” signs placed outdoors. These wet erase markers hold up well in the sun and wind, and even moist weather. Unlike traditional chalk, or dry erase; these liquid pens don’t rub off from casual rubbing or accidental mishaps. 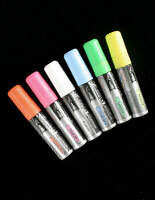 Another great feature to using these neon wet erase markers is that they wipe completely clean. Simply use a moist rag or paper towel to remove the liquid chalk and it’s as if it was never there; no ghosting, no stains or color bleeding. 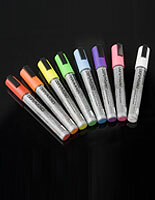 When used on an appropriate writing surface, such as a marker board, these wet erase markers will brighten up any text or illustration. No matter what type of environment they are used in; these neon liquid chalk pencils will add exciting color to your signs and get customers to take notice. Maker sure to purchase a set of fat tip and chisel tip wet erase markers in order to have a complete tool kit of utensils to create a noteworthy advertisement or sign. What types of marker boards can these wet-erase markers be used on? 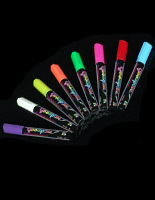 These fluorescent bright sticks can be used on just about any non-porous writing surface. 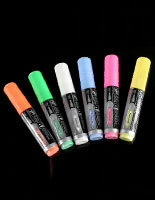 These wet-erase markers work best on a whiteboard, blackboard, or edgelit neon board. 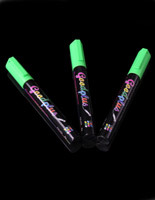 These fluorescent bright sticks can even be used on metallic writing surfaces for a striking effect. Can this wet-erase marker be wiped off with a traditional felt eraser? Typically a moist or damp cloth or paper towel should be used to wipe off the old or unwanted graphics. Although this wet-erase marker can be rubbed off with an old-fashion eraser, it takes much more effort, and can leave ghosting and colored residue. For more information regarding any of these fluorescent bright sticks, contact a member of our customer service staff and they will be happy to assist. 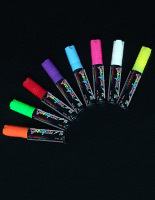 In addition to the bright sticks seen here, there is also a diverse selection of marker boards, liquid chalk boards, and other menu signs that are suitable for use with these fluorescent pens. Some of the other examples of marketing displays offered here include; sandwich board signs, wet-wipe boards, trade show accessories and write-on lightboxes. This corporation has been engineering and fabricating point of sale displays for more than forty years (since 1974). This company began as one man’s side job, and quickly grew into a very lucrative small business. In the beginning, the business built only simple acrylic fixtures, and then offered them to local financial institutions and “big-name” corporations around Rhode Island. Within no time an assistant was brought on board, pamphlets were distributed, and the number of returning patrons grew at an incredible rate. As the product line-up grew to include other types of marketing displays; factory workers were hired, a stand-alone building was purchased, and the orders continued to pour in. With the birth of the World Wide Web, this site was created and then the sales opportunities were practically endless. Over the past four decades, Displays2go has become a trusted leader in the business of selling display products. Since the beginning, many of the products have evolved to meet the needs of the shopper; however the company’s principles and dedication to quality customer service remains unchanged. Given the current economy; customers, now more than ever, are looking for the best quality for their money. In an attempt to satisfy this need; there is a large assortment of discontinued and sale items that are still high quality products, yet have been reduced to keep the warehouses clear from overstocked items. These goods are not damaged or inadequate; merely too much of a particular unit, or something that is no longer stocked. Another great feature offered here is the regular shipping policy. Orders that are processed prior to 3PM EST, typically ship the same day. For all other orders, the items are shipped the following business day. There are some exceptions to this shipping policy, such as custom graphic items, or large build-to-order display cabinets. There are currently over 7000 unique items for sale here among various different product lines. 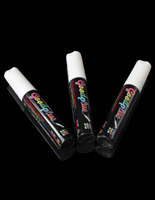 This site is the country’s first choice for all types of bright sticks and liquid chalk pens! We appreciate your business, and hope to see you back here again soon!